A poem by Oliver St John Gogarty (1878 – 1957) to Kit Orpen age 6. Kit – age 6 painted by her father William Orpen (1912). Kit Orpen-Casey (1906 – 2003) was the daughter of William and Grace Orpen. like an imp let loose in Heaven. And Keep still a minute, Kit! Then, may aid her recollection). Here’s Portmarnock! Here we are! Take your clothes off for the sea. Quick! make haste! You mustn’t dally. Are you coming humming Ally? See the sunlight on the spray! Jumping in the jumping water! Who has ever seen such living! Dipping, tripping up and skipping! out the pouring water Kit! Blest if I could manage it! If your Mummy won’t despise it! Tea, and talk to appetise it. Give back Kitty Orpen’s crackers. Is there none? No matter. Quick! Off you go to bed now Kitty. As on Kitty Orpen’s birthday. And knows the worth of difference. If I could you or you could me be? may have done amiss in Chelsea. Poem by Oliver St John Gogarty. 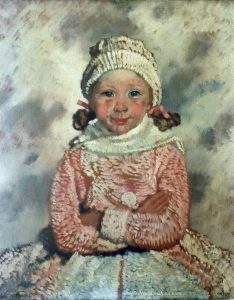 Oliver Duane Odysseus Gogarty (known as Noll, as mentioned in the poem), also age 6, son of Oliver St John Gogarty painted by William Orpen (1913). Oliver St John Gogarty by William Orpen (1912). N.B. ‘Ally’ in the poem refers to a Mr Alabaster who hummed a lot.